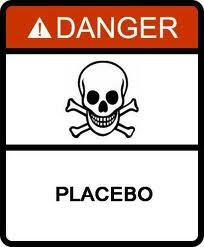 Placebos (tax credits, vouchers, Common Core) won't cure educational cancer. Ruling last week in the long-running lawsuit now known as the Breitenfeld case, the court overturned a ruling by a St. Louis County circuit judge and said a law allowing students in unaccredited districts to transfer is constitutional. It rejected arguments that the law violates the Hancock amendment to the state constitution as well as contentions from accredited districts that they could not handle the expected influx of students. Citizens from the receiving districts are concerned about financial reimbursement, class sizes and asking what authority school boards possess as even establishing residency requirements for district attendance is superseded by the state legislature. Is this a viable option for failing schools? Or are tax credits and vouchers the answer? Some education reformers who support tax credits and vouchers label themselves as conservative. But are these reforms actually conservative and is privatization the answer? How do conservatives support tax credits and vouchers when they will be subject to Common Core mandates that create national standards? The privatization/tax credit question was considered by Van Harvey who writes at Blogodidact.com. The following is reprinted with permission by Van (look for it in the future at his blog). It's a thoughtful discussion on what ails education today, the current reform measures (common core, charter/vouchers/tax credits) and begs the question if teaching what is "good and right and true" is the basis of education delivery or if it is the desire for standardization and preparation for the workforce. Privatizing Education cannot be our final goal, not if your goal is an America which understands what America means. Yes, vouchers are better than taxation alone, and tax credits better than vouchers, and local control is better than state control... as stage 3 cancer is better than stage 4, stage 2 is better than stage 3, etc, but as long as what you are aiming at is cancer rather than health... you truly have no recovery in sight. Yes it is important to reduce the cancer, but don't imagine that that is the same as eradicating it. Privatizing Education, while continuing to accept the same ideas of what an education is, if anything, will result in a more efficient and thorough spread of that cancer which is eating us alive today. 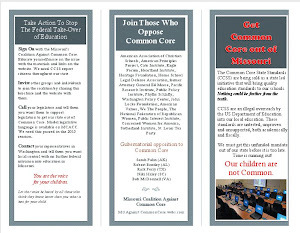 I'll try to be brief... but it is a strain to (as this series of posts will attest)... if you think I can rattle on about the constitution, that's nothing to the forests of HTML I can mow down in discussing Education - after all, the current state of our constitution followed from the 'progress' of our systematization of our method of education. Nearly universally accepted, Left & Right, is the idea that what our schools are for is to provide our kids with the skills they need to earn a living "and to compete with the Chinese! ", and that lesson is the single greatest and most revolutionary success the ProRegressives have achieved, and it has delivered us to the world we have today. That understanding of what the purpose of an education is, is what led to Standardized Testing in the first place, along with the system of school districts, under school boards, under superintendents, embedded within bureaucracies producing textbooks which further them, which we have today. He knew what he was talking about; when the purpose of getting an education is to acquire useful skills, for the greater good, the inevitable result will be a state which the people belong to, and are shaped by. The meaning of "Get an Education so you can earn a good living!" is not saying "Get an Education so you can live a life worth living! ", but simply get the skills needed to earn a good living, and education is done when they've got those skills that give them more of what they want - and more of what they want is all they want, and 'forget about all that "high falutin'" stuff'. This view wasn't new in 1909, or 1864, it was the reason why Sam Adams had to struggle for twenty years to get to the point of being able to become the father of the American Revolution, because he first had to wake up the populace that was being overcome by just that sense, that gathering skills and wealth was more important and pleasurable than liberty and virtue. The same sense which our 'Progressive' leaders, of the Left and Right, have for more than a century been proposing as being 'pro Education! ', highlighting the fact that 'progressives' are Pro-Regress, and that conception of an 'education' is fundamentally anti-American. If "American" can be said to have a meaning, it is at least in part the expectation of being secure in your property and able to live your own life, to seek 'life, liberty and the pursuit of happiness', without fearing the actions of your neighbor, no matter how strange, because they too respect the laws which make that possible. That view, that understanding, is not the result of acquiring skills to earn a living, but from understanding what makes life worth living, and then acquiring the skills which further it. The Education our Founders era received (if you can find this book, buy it), was one whose purpose was to introduce students to, and help them reason their way through (teach), the most valuable materials a person needed to know in order to become a virtuous, self-governing person, capable of living in liberty with their fellows in society. Those materials consisted in a small selection of the very best that had been written in literature (secular and religious), history, art & science. It was understood that a person who possessed that basis for an ever continuing Education, could easily master any skills necessary to live a life worth living, and that life was made even more worth living the more deeply you pursued your education, and a person so educated could achieve a worthwhile life and dazzling successes, because they first understood what was of worthwhile to a good life - the likes of Jefferson & Madison did not spring from nowhere, they can from that idea. The achievement and culmination of Western Civilization, was the understanding that when what is Good and Right and True is what drives you, then Power is harnessed (though never mastered) and made to enrich the lives of all, and the result of that was America. "Another defect in our schools, which, since the revolution, is become inexcuseable, is the want of proper books. The collections which are now used consist of essays that respect foreign and ancient nations. The minds of youth are perpetually led to the history of Greece and Rome or to Great Britain; boys are constantly repeating the declamations of Demosthenes and Cicero, or debates upon some political question in the British Parliment. These are excellent specimens of good sense, polished stile and perfect oratory; but they are not interesting to children." What Webster proposed was that what produced his own education, be traded for "...A selection of essays...", a synopsis of facts, soon to become factoids, that sought to pluck out the fruits of the West without the need to grow the trees they grew upon, which was the basis for that dazzlingly interesting feature of every child's 'education' today (and Cubberly's specialty) - the Textbook. When was the last time you saw a child willingly lugging one of these grey condensations of pap to the beach to read? What 'education' can follow from what no one, not even the teachers, have an interest in reading? "promptitude of classical allusions, a depth of research, a rapid summary of historical events and dates, a profusion of legal authorities, a prophetic glance of his eye into futurity, and a torrent of impetuous eloquence, he hurried away every thing before him"
That child was only able to be born, let alone conceived, because those classical allusions and dates were not simply recognized by those in attendance as trivia to be pursued, but matters which they understood and understood to be vital to the lives of each and every one there, and to their children as well. Without that understanding, America won't even be stillborn into future generations, having been aborted in ours or possibly the next. So yes, seeking to do what is practical now is important, and with subsidiarity in mind, the principle that political matters ought to be handled by the smallest, lowest and least centralized competent authority possible (that being, IMHO, neighborhood parents, and at that level, kept at that level, their being in government is not a problem (though always a danger)) moving towards vouchers and tax credits with as few strings attached as possible is as desirable and necessary as moving from stage 4 to stage 3 cancer. And moving from state run schools to charters and fully privatized schools will be just as useful as moving from stage 2 to stage 1 cancer. But don't be fooled into thinking that stage 1 cancer is what we should be seeking, if you want America back, that requires at the very least, an Education that imparts the materials and lessons that were necessary for its conception and birth in the first place. If what Van writes is true, then why are "conservative" lawmakers, pundits and lobbyists embracing privatization and Common Core mandates? These reforms (legislated by the State Legislature) are not created by the smallest, lowest and least centralized competent authority possible. Once again, a larger and centralized authority is dictating to the local districts on how they can/should operate and the school board's power is usurped. 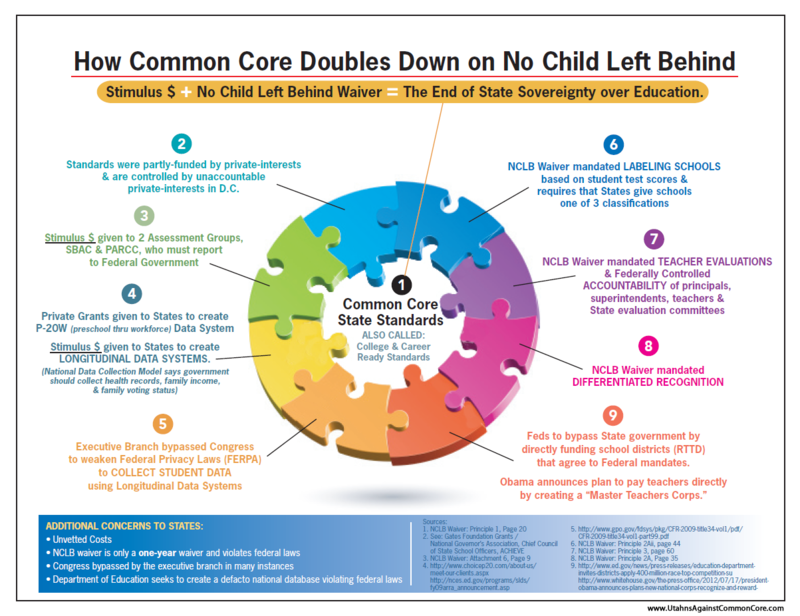 Do "conservatives" such as Jeb Bush and Mike Huckabee think they are fooling the citizens into thinking education delivered via vouchers, tax credits and charters are not under Common Core mandates? These mandates are not individualized and state/locally driven. They were not created by the smallest, lowest and least centralized competent authority possible. Don't be fooled into thinking privatization, tax credits and vouchers are the answer for educational ills. The issue may not be so much where a child attends school but rather, what the child learns, how the child learns and who controls those educational developmental/directional theories. When a system is riddled with cancer (loss of local districts structuring educational practice best for its unique community), the system needs to be radically altered vs treating it with placebos. What we need is to eliminate all federal interference, divide up the big districts into community-sized districts, and create neighborhood-sized schools. THAT is the radical cure that needs to be done to eliminate the cancer. 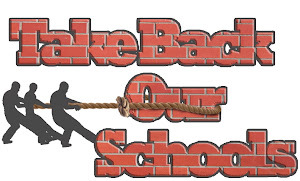 See http://www.smallerschools.org/research.php?ref=deregulation-of-public-education.